This afternoon we, along with Little Miss S and her parents, took a walk along the breakwater. It was a sunny afternoon. Along our walk we heard Spanish, Chinese, German, English, and other languages. Do you think that had something to do with the cruise ship in port? Boats of all kinds went to and fro. 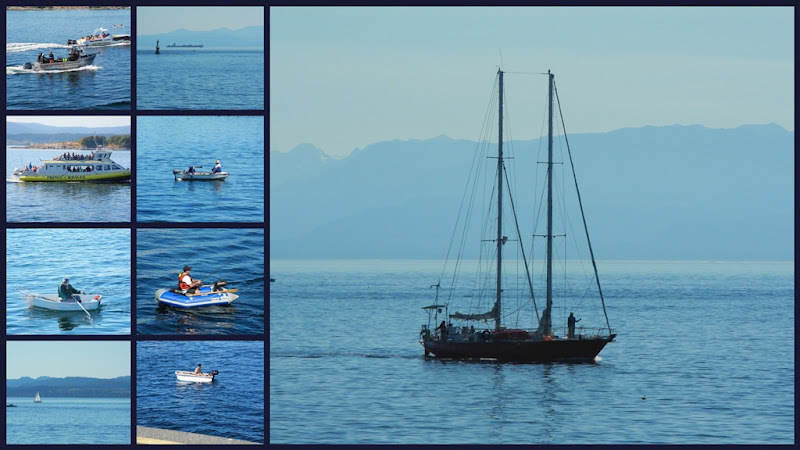 Sailing ships, tankers, whale watching boats, kayaks, fishing boats, inflatables, even one that looked like a bathtub. This ferry plies the waters between Victoria, in Canada, and Port Angeles, in the USA. This photo shows the ferry headed towards Port Angeles. We were back at the harbour when it returned, picking up friends visiting from the USA. I hope your Sunday was equally sunny. Joining in with Mosaic Monday, hosted by Mary of the Little Red House. Looks like a place I would so enjoy. Wonderful photographs, what a fabulous mosaic they make. We've sailed on that ferry from Port Angeles to Victoria and back, happy memories. It's great that the tourists are still here - and that our weather has been fantastic too! That looks like a very interesting and beautiful place to visit. Our Sunday was far from sunny. It rained all day and it looks like more of the same today. Oh well, we needed it. We're closer than we think! I photographed that cruise ship right in front of my home this weekend -- will post it later this week. Oh how interesting that you have a reader not far down the way from you. Way cool. When we were in Portland today, we learned that they'll have four cruise ships in town. This is very good as many of them purchase hundreds of pounds of lobster for the passengers. Anything to boost the economy around here a wee bit. We visited your lovely port on a cruise ship not long ago! And yes...we had a lovely, sunny Sunday as well. Lorrie, you are so blessed to be able to get to the water so often. Love all the lovely blue water in that mosaic. It must be so nice, and even entertaining, to live so close to the ocean as you do. I keep trying to talk my Farmboy into moving to Oregon near the coast and he keeps trying to talk me into the Caribbean. I agree with the others... it's so nice that you live that close to the coast. I always enjoy seeing the water in your posts! Beautiful! I grew up by the sea on the south coast of England and I took it totally for granted until I moved away...and now I yearn!! I love watching ships and boats. Would hate to live far from the coast. Looks bright but chilly here. That is an amazing sight to see! It looks like the perfect way to spend the day and get some awesome photos, too! Hugs! I love the sea and would love to take a trip on that ship. Beautiful mosiac. All the blues are so pretty Great pics - Thanks for sharing them with us.